Spring drills are underway at Iowa where the Hawkeye football team has renewed confidence following last season’s 8-5 record that concluded with a loss to LSU in the Outback Bowl. “Last year was a positive step for sure, and it was disappointing two years ago and we moved on and went back to work. And really that’s what we have to do now,” Iowa coach Kirk Ferentz says. He says there’s such a fine line between winning and losing in any college sport and they have a lot of work to do. 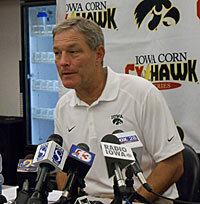 Ferentz admits expectations have returned after last season. “Most years since I’ve been here we’ve had an opportunity to have a good football team, but the important thing for our players to understand is that we have a lot of work to do and nothing can be assumed,” according to Ferentz. Ferentz says the concern at this time of year is replacing the seniors and the Hawkeyes lost all three starters at linebacker. He says those guys played at a high level and also provided great leadership to the team overall. Ferentz wants the new linebacking corps to play aggressive and not worry about making mistakes. Ferentz says they are not going to lose a game this spring, so they want to cut things loose and see where they are at. He says it’s not a crisis right now if they blow an assignment and miss something, so they want to have them play all out. Iowa returns to Valley Stadium in West Des Moines for a practice on April 12th and will close out spring practice with a scrimmage on April 26th.